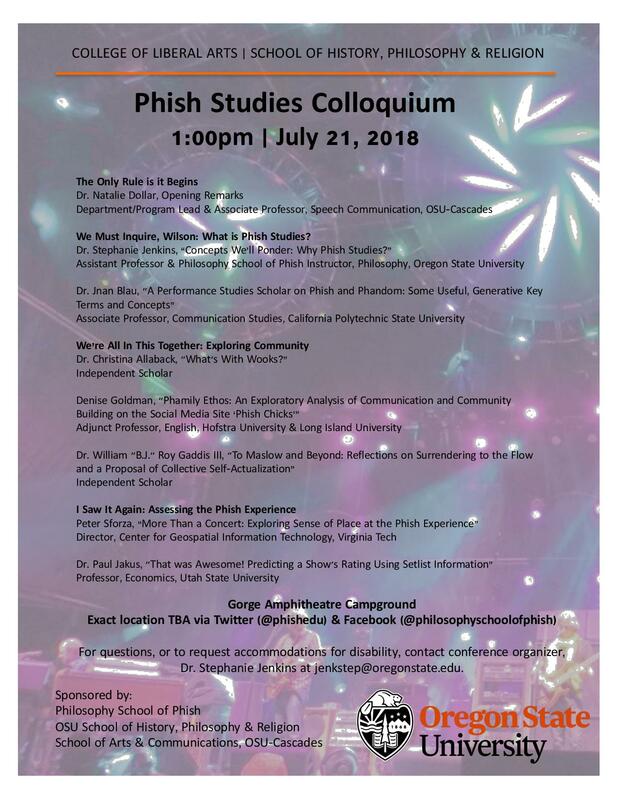 The first academic conference highlighting research in the interdisciplinary field of Phish Studies will take place on July 21, 2018, at 1pm in the Gorge Amphitheater Campground. The event is hosted by Oregon State University’s School of History, Philosophy, and Religion. An exciting lineup of scholars from across the country will present their research to OSU students attending the Philosophy School of Phish field trip to Phish’s three-night run at the Gorge Amphitheater. The conference will also be open to the public. The exact location of the event will be announced on Friday, July 20th via Twitter (@phishedu) and Facebook (@philosophyschoolofphish). Please RSVP on the Facebook event page. For more information, or to request accommodation for disability, contact conference organizer, Dr. Stephanie Jenkins ([email protected]). I thought I was excited about the sights and jams at the Gorge this year. Then I see that I can hear a lecture titled "What's With Wooks?" delivered by Dr. Christina Allaback. I have quite literally never been more excited in my life. Liberal Studies-heads unite! Way cool. Going to try and make this. I would definitely like to learn more about predicting a show's rating using setlist information. I won't be at the Gorge, but if anyone can send me ANY info from that presentation, that would be awesome. I’ve rented audio/video equipment so we can document the talks to make available online after the event.